Golf course topdressing involved applying a mix of soil products or a surface a conditioner such as Profile™ Field and Fairway™ or Turface® MVP® top of the playing surface. Topdressing smoothes out the surface of the course. More importantly, topdressing fills in aerification holes with amendments to keep channels open for air and water to penetrate to the root zone. Topdressing with calcined clay keeps surfaces drier during heavy rain events. Some considerations for the best topdressings to use include. 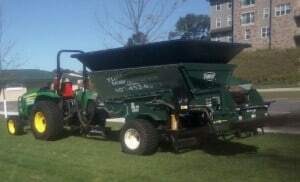 Sand is a common and inexpensive topdressing material. Sand only provides porosity where the sand particles bridge to create pockets of air. Calcined clay has the advantage of both internal pore space as well as bridge pore space between particles. Calcined clay holds moisture and nutrients benefiting the turf. Applying a topdress of sand is the minimum approach, but many golf courses are experiencing added value when they topdress with a calcined clay products like Profile™ Field and Fairway™ or Turface® MVP®. The benefits of topdressing with a calcined clay include leaving channels in the filled aerification holes. This permits an improved exchange of water and air at the root level. Promoting a deep, strong root structure, is necessary to handle the day-to-day use of golf course turf. The long degradation time for Turface® prevents future compaction. Topdressing of turf areas it typically done with conditioner at a rate of 500 pounds per 1000 square feet. This should be accomplished by the use of a hopper-type topdresser, a properly calibrated rotary spreader, or the bucket of a tractor. Repeating the process a year later with an application of 500 pounds of calcined clay will provide the best results for most golf course playing areas.